The 9 Best Christmas Tree Farms in Michigan! Nothing welcomes Christmas like a freshly-cut tree. Farms across Michigan have trees primed and ready for you and your family to pick out and cut down. From firs to spruces, visit these 9 best Christmas tree farms to get your home ready for the holidays. Head on out to Scotts and check out Tuinier's Christmas Tree Farm. This choose-and-cut style farm will let you pick your favorite tree of the lot. That keeps them fresher longer, and makes them look better on getting them home. 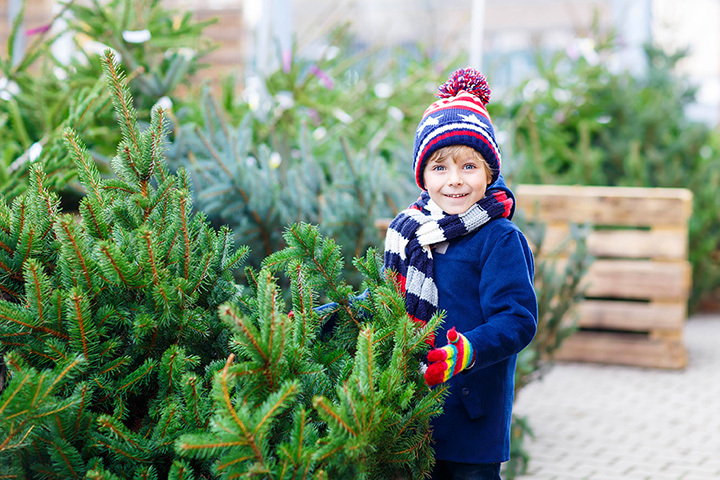 Featuring Canaan and Fraser firs as well as blue spruce, and even wreaths, you'll have plenty to choose from to get just the right tree. Out in Allendale, Bosch's Countryview Nursery stands ready to offer you plenty in the way of potential Christmas trees to adorn your living room, alongside wreaths, roping, certain arrangements, and even an ornament known as a “kissing ball.” But Bosch's steps things up a bit by offering wagon rides and an array of hot drinks and snacks on the weekends. Come check out the free popcorn balls, and even pay a visit to Santa Claus on some days. Most everything you could ask for is on hand here at Bosch's. Timberly Tree Farm in Sturgis runs the gamut in terms of tree offerings, with several varieties of not only choose-and-cut for those who want a full Clark Griswold experience—only one that ends well—alongside several varieties of pre-cut tree. Fair warning: traffic can be a little sticky according to some reports, so you'll likely not want to come in a hurry. The farm also offers the Timberly's Treasures Up Top gift shop in the barn, with wreaths, garland and tree decorations on hand. Even the Upper Peninsula folks need Christmas trees, and one of the biggest such operations out that way is near Carney, in Treichel’s Trees. Featuring a choose-and-cut operation, with 85,000 trees on 280 acres, it's a safe bet you'll find just the tree you want. Add on wreaths and some similar services to round out the overall process nicely. Dutchman Tree Farm in Manton offers an impressive variety of Christmas trees for those interested, especially if you're looking for a fir for your Christmas decor. Dutchman has five different varieties of fir, including grand, Fraser, balsam, concolor and Douglas. It goes on from there, to include wreaths and live trees in container-grown or balled-and-burlap. Sometimes there are even special events to make the whole process better. Nothing says winter like red flannel, and nothing says Christmas like Red Flannel Christmas Tree Farm in Cedar Springs. With both pre-cut and choose-and-cut options on hand, you'll have more than enough to choose from, especially if you like fir trees. You'll have Fraser, Douglas, balsam and concolor fir, but you'll also have a comparative rarity in fir, the Canaan. There's plenty more on hand, of course, including a gift shop and wagon rides. Horton's Gwinn's Christmas Tree Farm goes for the complete experience. They're not only offering choose-and-cut, but also in several different varieties. Add tree boughs and wagon rides and it's a pretty complete day out. But when you've been out too long and crave a chance to warm up, check out the cookies and hot chocolate on hand to put that spark back in your chilled soul. Hunt 4 Your Fir, in North Branch, has something special on hand. It's a choose-and-cut operation, and if you don't want to do the cutting, they can do it for you. But what's really special about this place is that it focuses exclusively on firs, including Fraser, Canaan, concolor and Douglas. Throw in a set of wreaths, disposal bags, and "answer stands" that allow for rapid setup once you get the fir of your choice back home. Head out to Peck and check out Rocky Top Christmas Tree Farm, a farm measuring 20 acres in breadth and offering a wide array of trees on hand. You'll have Colorado blue spruce, Douglas fir and scotch pine on hand, in your choice of pre-cut or choose-and-cut options to make sure you get just the right tree. Throw in garland and wreaths and you'll have everything you need to make that Christmas wish for impressive decor come true.